Sustainable Tourism Advice for Destination Marketers: Keep it Real! 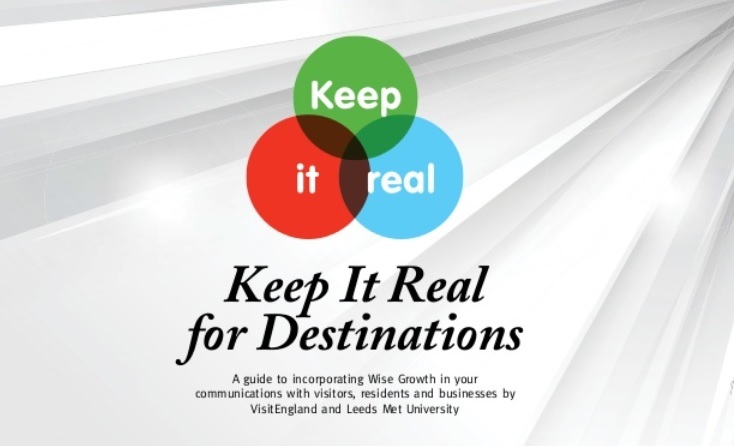 To help destination marketers with this task, Leeds Metropolitan University and VisitEngland recently developed a marketing toolkit for destinations called Keep it Real, which puts the focus on tourism issues at a destination level. The toolkit consolidates some great examples of good practice from a range of organisations working for and with destinations in England. This compilation will help to inspire those working in destinations to think creatively about how best to communicate their own sustainability initiatives. It will be valuable resource for anyone wishing to know more about marketing sustainable destinations. Keep it Real for destinations is available to download here. One insight from the booklet that we find particularly relevant is that a better overall experience during their stay means visitors are more likely to respect and connect with the local culture, environment, residents and businesses. You might also be interested in our short interview with booklet co-author Professor Xavier Font on how (not) to communicate sustainability as part of destination marketing. Enjoyed this post on the Keep it Real booklet for destination marketing and branding professionals on how to communicate sustainable tourism authentically? Share and spread the word!